Damn I hate that sign. 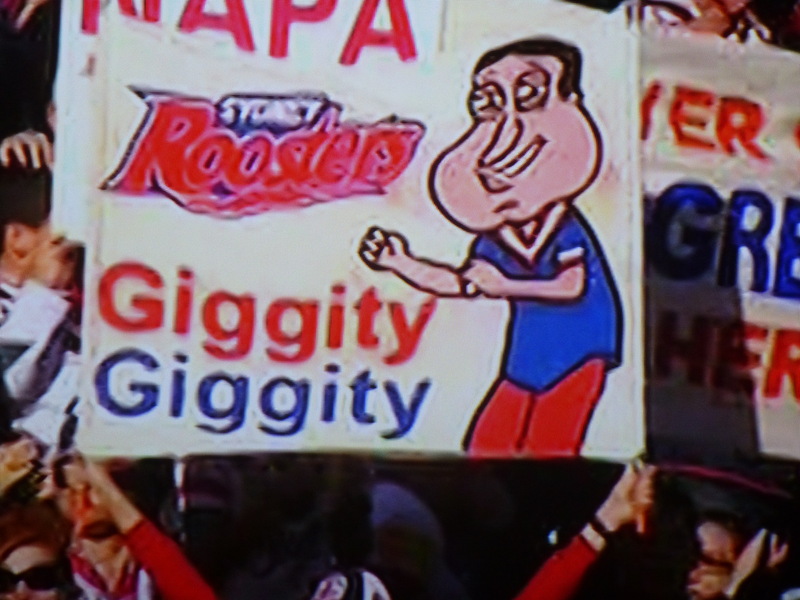 I don’t watch Family Guy, and playing the Roosters in 2015 certainly doesn’t make me want to start. Probably the less said the better about the actual sequence of events this past weekend. It might be enough to say that on Sunday afternoon at Allianz, the men from Mt Smart were shutout by a side that harassed them into submission. The Roosters both out-hustled and out-classed the Warriors, who were always on the back foot despite remaining level on the scoreboard during the opening 20 minutes. I’m very tempted to leave it there. To me, Sunday feels like one of those games where, as a fan, there’s no other option than to write it off as history and move on with your life. The Roosters defence was at its stingy best (they’ve now conceded only 72 points at home in eight games) and the Warriors were back to their old tricks, completing only three of their first ten sets. When they did keep hold of the ball, there were glimpses of what the men from Mt Smart are capable of, with Chad Townsend looking the most dangerous in the early stages. But, during a 10-minute burst just after the 20-minute mark, the Sydney-siders went bang, bang, bang, piled on 18 points and essentially ended the contest. While the Warriors hung in there after things threatened to get ugly early in the second half, they never looked like getting back in the match and were comprehensively beaten come the final whistle. 1) Perhaps the most concerning aspect of Sunday’s match is that the Warriors froze on the big stage once again. Much like their trip to Perth, the men from Mt Smart went into this game on a high and in good form. But, unfortunately also like their trip to Perth, they never really gave themselves a chance with a high error rate and a lack of energy in the early stages. 2) The energy side of things is puzzling. The Roosters’ smothering defence did well to shut down the Warriors’ playmakers but, at times, the Kiwi side was incredibly static, and thus incredibly easy to shut down. Instead of the fluid attacking play we’ve seen in recent weeks with a number of players in motion, there were plays where it seemed like no one really knew what was happening — a case of ‘here, you have it’. Part of this likely comes from the struggles the Warriors had getting out of their own end, but it was alarming all the same. 3) As much as we fans would like to move on and pass that game off as ‘a bad day at the office’, the Warriors have a real chance to learn from the experience. This Roosters side is a quality outfit. There’s no doubt they’ll be right in the thick of it come finals time, and on another day could easily have racked up more than just 24 points. The way they defend territory, not allowing the opposition out of their own end, and also defend their own line with patience and confidence, provides a perfect example of how to win in a big-match environment. 4) Individual players can learn a lot, too. Solomone Kata is probably still having nightmares about Blake Ferguson. Fergo broke our hearts in Round 14, and this week he steamrolled Kata with every opportunity he got. And, as terrible as that looked for young Solomone, I hope he’s looking at that footage and soaking it all up. It’s often been said that you learn a lot more from failure than you do from success, and Kata’s debut season in the NRL has been one of great promise. Although he was shown up by Ferguson, he never stopped competing, and I’ve got a good feeling that this is going to turn into a positive, much like Manu’s horror show against Parramatta all those years ago. 5) Dear Stephen Kearney, Jared Waerea-Hargreaves would like his Kiwis jumper back. He’s seen as the enforcer of this Roosters pack, and on Sunday he was excellent. He set the platform up the middle of the park, an area the Warriors have been strong in recent weeks, and generated even more metres for his teammates from his offloads. If he plays like that for the rest of the season, Stephen Kearney is going to find it tougher and tougher to leave JWH off the teamsheet. And, while we’re talking about JWH, did anyone else think this wasn’t a penalty? 6) Could Raymond Faitala-Mariner become a genuine option at centre? Okay, so last week on Facebook we were discussing how we could fit Fusitu’a, Kata, Hurrell and Lolohea in the one backline when healthy. But is it possible we overlooked another potential solution? Faitala-Mariner impresses me more and more every time I see him play in the top grade, and he’s filled in at centre a number of times now when injury has struck. It’s probably not the number 1 option, but, when Hoffman comes back, I think it’s at least something to consider. Sam Tomkins makes a huge difference to this Warriors side. I know I keep saying it, but the expensive Englishman has added plenty since his return from injury. As much as it is possible to say a million-dollar man is underrated, I think those dollar signs are tainting the way many people view his play. Sunday was Tomkins’ first loss of the season, but very little of the blame falls on his shoulders. He was strong defensively, by my count making 4 try-saving tackles, and is a crucial link man in the Warriors attack. While he may never get the opportunity to change everyone’s opinion, I’m picking by the end of the season we’ll be sad to see him go.